I am moving into professional stained glass and this requires me to push Glass Eye 2000 to its limits. 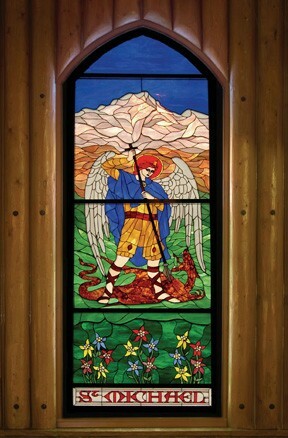 A good example of this is my St. Michael slaying the dragon, which is only one of 25 windows that I completed for the Our Lady of the Mountains Catholic Church here in Estes Park, Colorado. The window sits high on the west side of the church just above the choir loft. It is 3' x 9' and contains over 1100 pieces of glass. It is in an aluminum frame inside the original wooden frame. The awe-inspiring part of it is that in late April, as I was getting close to finishing all the windows, I was in the sanctuary picking up tools, and I turned around to see the setting sun with no clouds. The sun was lined up directly through the window. It was lined up directly I grabbed my camera and this is what I saw. I walked up and down the aisle taking pictures which changed the hot spots in the windows as it highlighted different sections. When you compare the original under regular light, it's hard to believe it's the same window! This series of pictures of the St. Michael window was taken in the early evening when the setting sun lined up directly with the window. As one moves up and back down the aisle, the hot spot moves on the window, highlighting different areas and changing the colorations and intensity. It also puts a long area of color down the aisle leading to the altar, and at one time, lighted both the altar and the cross with seemingly separate lighting. For over 35 years, the Urban Rancher has been designing and creating stained glass windows. Living in the mountains of Colorado, he has specialized in flowers, animals, birds and landscapes; however, in the past several years, there has been a transition into liturgical themes. He does take orders for custom work, to be done during the months of December through March. Jay can be reached by email.